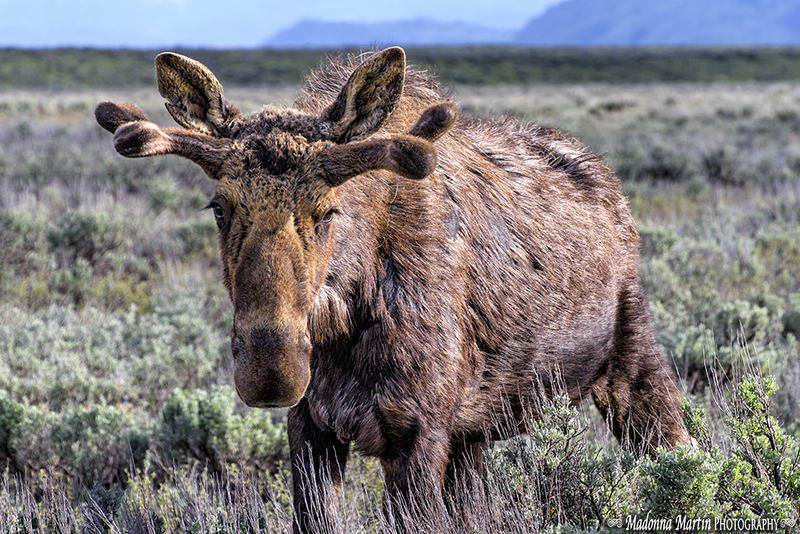 If you ever have a chance to photograph a wild moose and you see this look – head for the hills! The Tetons photo tour group came upon this beautiful creature not long after a jerky teenager had tormented it. So we were wary of its temperament, and we attempted to keep a respectful distance, as dictated by park regulations. I knew that the moose was not in a happy mood when I saw his direct attention through my camera’s viewfinder. Wasting no time, I scrambled for cover behind the tour vehicle, and another photographer was pushing me from behind. I almost fell down in a ditch in the process. Oh yes, a heart attack was imminent too. The bull moose charged. However, it ran toward the back area of the tour vehicle while I was huddled near the front. Whew. Ah, the joys of wildlife photography! Heavenly days! So glad you weren't hurt. Good grief! Nothing more dangerous than a ticked off big old moose with an itty bitty brain. I would not have enjoyed being there. Nothing like a kick start for free every now and then, though. I do believe I could count the hairs on his coat. I don't know how you could think to take a picture! my goodness, what a dangerous life you lead. Great photo though. Love the photos that have a great story and adventure to go with them! A scary situation. So glad he didn't find you and 'get' you! Your photo is so real I think I could reach out and touch the texture of his fur! Yes, he seriously has had enough! Great picture and I'm glad you didn't get booted in the process! run quick! We came across quite a few moose when we lived in Maine. We let them have free reign and stayed WAY back. Outstanding "I see you" closeup Donna! Oh moose are dangerous creatures and not to be fooled around with. I'm glad no one was hurt by either the moose or falling in the ditch. That would be a scary experience but you got a great photo out of it, Donna. It's an amazing photograph with a 'story to remember!' Wow! I love seeing his fur and his face. Glad you all were okay! Wow...he's awesome...great shot! I have heard how mean they can be. You are a brave soul. I hope you enjoy you July 4th weekend! Omggg! Well, at least he didn't get you! Moose are my favorite animals, I would love to have been on that tour bus with you. I see your wonderful photos and wonder what I'm doing wrong. I just can't seem to get my shots to have your crisp focus. Your Wyoming trip photos are outstanding, thanks for taking the time to share them. Enjoy your day!